So I've been gone for a good part of the day on a sewing machine repair call. But I found some time to get in an old favorite flick of mine with my folks. Tonight my mom & dad wanted an Eighties fantasy film with some romance and heart. So we settled on Legend from Eighty Five, which has attained the status of a cultclassic film with a plot that draws heavily from the fairy tale and mythological traditions;"Legend is a 1985 American-British dark fantasy adventure film directed by Ridley Scott and starring Tom Cruise, Mia Sara, Tim Curry, David Bennent, Alice Playten, Billy Barty, Cork Hubbert, and Annabelle Lanyon. It is a dark fairy tale and has been described as a return to more original, sometimes disturbing, fables, from the oral tradition of ancient times before reading and writing were widespread." Legend basically tells the story of the Lord of Darkness hatching a plot with a group of mercenary goblins to kill the last two unicorns who guard the power of light. ""Once, long ago", the ancient Lord of Darkness (Tim Curry) laments his isolation in the shadows before sensing the presence of two unicorns who safeguard the Power of Light; whereupon Darkness instructs Blix (Alice Playten) and his fellow goblins Pox (Peter O'Farrell) and Blunder (Kiran Shah) to kill the unicorns and bring him their horns to free himself." There's a dream like quality to the film & the plot sounds like something straight out of HP Lovecraft's Dreamlands cycle. But there's a subplot in which the Lord of Darkness wishes to bring on eternal night to this storybook world. He also wishes to bring over his father whom its implied is a sort of anti god whom the Lord of Darkness is acting on his behalf. Its through dreams that the Lord of Darkness influences mankind. When the apocalyptic events happen the dream world is plunged into a wintery darkness, time stops, & for a brief moment the creatures of Farie & darkness have free reign over the Earth. Or that's how it seems. In actuality I think what we're actually seeing is the Lord of Darkness trying to forestall the End of Days. The action of Legend takes place inside of HP Lovecraft's Dreamlands with the whole of mankind's fate at stake. H.P. Lovecraft, "The Call of Cthulhu"
A year after Legend came out, a John Carpenter's film came out called Prince of Darkness. It was one of those films that gets under your skin & it share many minor plot elements of Legend. A secret Catholic sect called “the Brotherhood of Sleep” has been covering up a major secret as the son of the anti god is coming back into our world. There is a fluid that contains his life essence and it means to create a gate way from our world into its and as this happens reality begins to break down around it. A crack team of college students and their professor are brought in to translate a book of forbidden knowledge and dissect a swirl cylinder of liquid evil. Meanwhile the Earth is having a major eclipse & reality seems be breaking down in preparation for the return of the anti god. There appear to be several forces & factions at work helping this come about. One of which is a beetle like faction of Great Race of Yith allies of the son of the anti god. I say beetle like because they seem to correspond to the beetle like creatures mentioned in The Shadow Out of Time. "After man there would be the mighty beetle civilisation, the bodies of whose members the cream of the Great Race would seize when the monstrous doom overtook the elder world." "Perhaps these entities had come to prefer earth's inner abysses to the variable, storm-ravaged surface, since light meant nothing to them. Perhaps, too, they were slowly weakening with the aeons. Indeed, it was known that they would be quite dead in the time of the post-human beetle race which the fleeing minds would tenant." As the son of the anti god's power continues to grow things go from bad to worse. 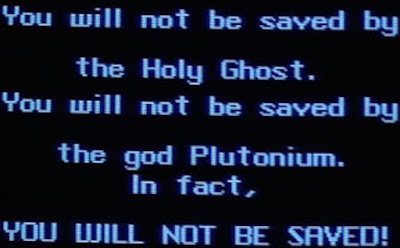 World War III is referenced as zombies of weird aspect wander the grounds around the church where all of the events of Prince of Darkness take place. So are we seeing how the old Earth passes away before the Great Old Ones come back? I actually think so. Prince of Darkness was written by "Martin Quatermass" a pseudonym of John Carpenter but in the fictional universe of the film is the character is brother of Bernard Quatermass who confronted ancient evil in Quatermass and the Pit and The Quatermass Conclusion. But it was The Stone Tape in the Quatermass series that really hooked into the vibe of Prince of Darkness; "Combining aspects of science fiction and horror, the story concerns a team of scientists who move into their new research facility, a renovated Victorian mansion that has a reputation for being haunted. The team investigate the phenomena, trying to determine if the stones of the building are acting as a recording medium for past events (the "stone tape" of the play's title). However, their investigations serve only to unleash a darker, more malevolent force." Many of the ideas of these films & stories plug into a darker more sinister undercurrent of the mythology of the Biblical & the occult. These trappings are something that we see in classic Star Trek over & over again. In the 'Alternative Factor' from season one we get a matter & anti matter versions of the time traveler/dimension traveler Lazarus. ""The Alternative Factor" is a first season episode of the American science fiction television series, Star Trek. It is episode #27, production #20, and was broadcast on March 30, 1967. The episode was written by Don Ingalls, and directed by Gerd Oswald. In the episode, the crew of the USS Enterprise encounters a "reality jumping" madman. It is the first Star Trek episode to deal with a parallel universe." Should Lazarus escape into the Trek universe the whole of reality would be destroyed. Much of the time/dimensional traveling equipment looks like the type of set up that the Great Race of Yith might use. Another episode that uses many of the elements of mythology of the Biblical, the occult, & classic Shakespeare is Catspaw. ""Catspaw" is an episode of the second season of the American science fiction television series, Star Trek. It is episode #36, production #30, and was first broadcast October 27, 1967, and repeated on May 24, 1968. It was written by Robert Bloch, and directed by Joseph Pevney. This episode was the first filmed including series regular Pavel Chekov, as depicted by Walter Koenig, although its airing was delayed to coincide with Halloween, by which time several other episodes featuring the character had been broadcast." 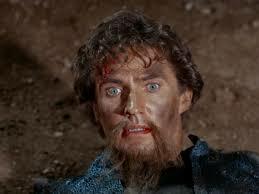 Catspaw uses many of the classic motifs of the occult mixed in with a good dose of the Tempest by William Shakespeare. Kirk & crew find themselves at the mercy of Korob & Sylvia two 'travelers' & explorers from another galaxy who torture the crew of the enterprise. Here's the part that interests me, " Sylvia takes an interest in Kirk and changes into different attractive forms to test his emotions. Sylvia tells Kirk that she and Korob are explorers from another galaxy. They wield their power through a device called a transmuter, which gives them control over matter. Sylvia decides Kirk is using her and becomes angry, sending him back to the dungeon." The Transmuter not only turns thought into matter but warps reality to suit the needs of the user and it sounds just like another machine that also uses similar technology. " “Morbius— a big machine, 8000 cubic miles of klystron relays, enough power for a whole population of creative geniuses—operated by remote control! Morbius--- operated by the electromagnetic impulses of individual Krell brains. [..] In return, that machine would instantaneously project solid matter to any point on the planet. In any shape or color they might imagine. For any purpose, Morbius! Creation by pure thought!”"
So what does all this have to do with Clark Ashton Smith? Well we know from the timeline established in "An Adventure in Futurity" By Clark Ashton Smith that events don't go well for mankind. By the time we get to the era of Zothique the demon god Thasaidon "black god of evil" has become one of the dominate gods whose cult has spread far and wide. "Thasaidon "black god of evil", "the archfiend", "lord of the seven hells beneath the earth" is the chief. He is depicted in the form of a warrior in full armor, wielding a spiky mace; he is also said to have "dark horns" and to sit on a "throne of ever-burning brass". Thasaidon gives help and power to those necromancers who put themselves at his service. He gave aid to the ancient king Ossaru who dominated half Zothique (TS); he aided the sorcerer Namirrha in his projects, until he projected the destruction of Xylac,(DE); he lent his power to Xeethra, in whom the spirit of the long-dead King Amero was revived, and allowed him to restore the kingdom of Calyz, for a time, to its former glory. 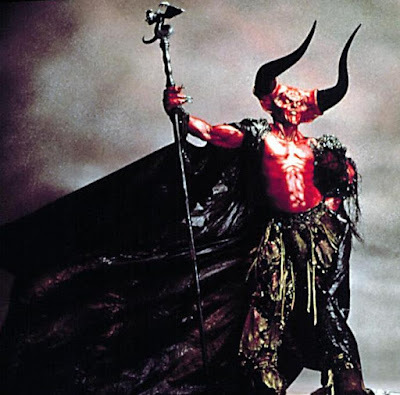 (X)"
Sounds an awful lot like 'The Lord of Darkness' from the film Legend as depicted by Tim Curry. So what happened? At some point the Anti god came through and all of reality began to break down. The stars came right & all Hell literally broke loose as the bounds reality shattered. Is this really what the tales of the Lovecraft circle warned about? I think so. The Great Race might have monkeyed with forces far beyond their control and they've been trying to make things right for eons. Do I have any proof that these connections are legitimate? Sure in the 'Dark Eidolon' by Clark Ashton Smith we really get a look inside a world that has gone to riot & rot with the wastelands of Zothique mirroring our own world. 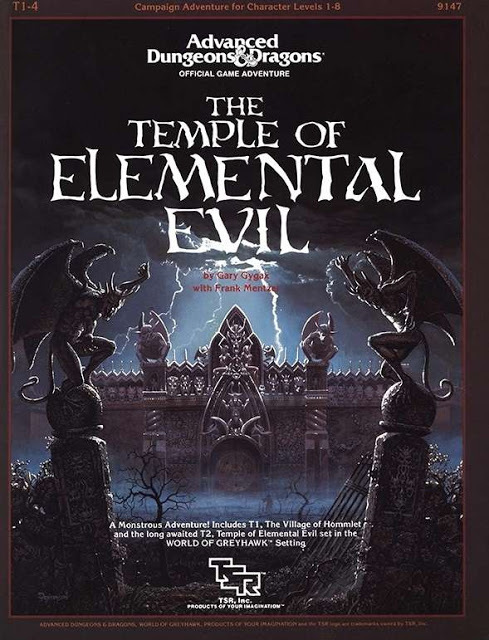 In many ways this also mirrors the AD&D first edition adventure Temple of Elemental Evil. The influence of the cult of the White Worm grows & the ancient evils of the Old Earth begin to stir again. The influence of the anti god is on the rise and evil things begin to stir again. The old world has passed away eons ago but the gods remain to have back their strangle hold on our little world.